Are you a tea drinker? We are big time fans of a good cup of tea - and so we shed a tear when Dobra closed it’s Black Mountain location. It was an awesome place to find new and different teas, or fill up on some old favorites. They are missed. But we are attempting to fill the void left in the tea-drinking universe building up our offering of high quality teas. And while we can not recreate the ambiance of the tea room, we feel that we can serve the discerning tea drinking with a nice variety and, of course, our knowledgable staff. Why do we carry loose leaf tea instead of teabags? For a simple reason: the highest quality tea is sold in loose form. Most teabags are filled with what’s left over after the loose tea has been packaged. You tend to get a lot of dusty residue in teabags and not as much of the full leaf. And, also, with loose leaf tea, you can make your cup as stronger or weaker as you like. Do you like a teaspoon of tea leaves per cup? Or maybe a tablespoon per cup? You are in control. Loose leaf teas are an economical way to enjoy your quality teas. While good tea seems expensive at first glance, most teas can take a second or third steeping. In fact, some of them (oolong comes to mind) taste better on the second steep. Is correct water temperature important? Or is boiling water the way to go? In the same way that the best coffee is made with a consistent and specific water temperature, so it is with tea. 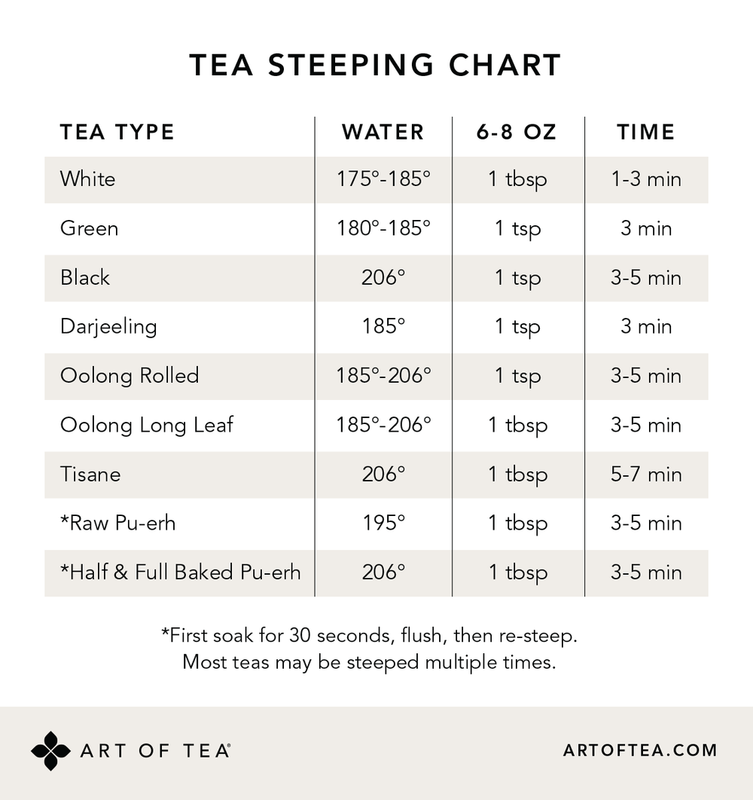 In fact, the water temperature varies quite a bit depending on the type of tea you are steeping. When in doubt, use cooler water. Whereas teas can be ruined by water that's too hot, they are rarely hurt much by water a few degrees too cold. Boiling water and then letting it cool removes oxygen from the water and decreases the flavor of the tea. It's better to bring water up to (rather than down to) the appropriate temperature. You can use this handy chart to guide you. Feel free to experiment a bit - if the first cup is not to your liking try lowering the water temperature a bit and see if that changes things to your liking. What is the difference between White tea and Black tea? Is Green tea really tea? What are herbal teas? Let’s start with traditional tea. All types of traditional tea come from the same basic plant, the Camellia Sinensis plant. The differences between teas arise from processing, growing conditions, and geography. Black tea is allowed to wither, which precedes a process called oxidation (sometimes incorrectly referred to as fermentation) during which water evaporates out of the leaf and the leaf absorbs more oxygen from the air. Black teas usually undergo full oxidation, and the results are the characteristic dark brown and black leaf, the typically more robust and pronounced flavors of black teas, and when brewed appropriately, a higher caffeine content compared to other teas (50-65% of coffee, depending on the type and brewing technique). Herbal teas—properly called called tisanes—are a major part of the tea world, but they're not technically teas because they are not made from leaves from the Camellia Sinensis plant. Tisanes are caffeine free and can be served hot or cold. Herbal teas have a long history, dating back to ancient China and Egypt, where tisanes were drunk for both enjoyment and medicinal purposes. They can be made from leaves, flowers, bark, seeds, other plant-based sources. They are wonderful in their own right and need not be looked down upon by the tea-drinking world. What has more caffeine - tea or coffee? The answer may surprise you. Pound for pound, tea has more caffeine than coffee. But, they are brewed so differently that the amount of caffeine in a cup of tea is much less than a cup of coffee. Think about it - a pound of coffee might last you a week or two, but a pound of tea will last you a year (at least). A pound of tea is a BIG BAG. So while tea itself is a caffeine juggernaut, that cup of tea you are brewing is not. Ahh…this is where the fun comes in. You need to come in, buy some, and see for yourself. This is one of the great part about the tea world. The variances in taste are great and they all have their distinct charms.